Man City dropped to third in the table after being beaten for the third time in the last four matches. 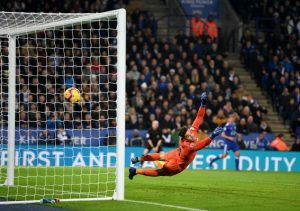 Leicester came from behind to beat the reigning champions, with Marc Albrighton cancelling out Bernardo Silva’s opening goal, before Ricardo Pereira scored a stunning winner nine minutes from time. The visitors ended the match with 10 men as Fabian Delph was shown a red card in the final minute of normal time. Liverpool made the most of City’s defeat by moving six points clear at the top of the table with a 4-0 thrashing of Rafa Benitez’s Newcastle. Dejan Lovren scored the only goal of the first half, before the floodgates opened after the break. Mohamed Salah, Xherdan Shaqiri and Fabinho all found the back of the net in the second 45 to ensure Liverpool completed the entire first half of the season without suffering a single defeat. Spurs are now Liverpool’s closest challengers having moved into second with a stunning defeat of Bournemouth. 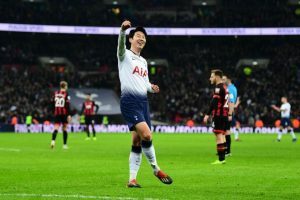 Heung-min Son grabbed a brace with Christian Eriksen, Lucas Moura and Harry Kane netting the others to make it 11 goals scored for Tottenham in their previous two Premier League matches. The north Londoners have matched Arsenal’s record, set in 1983/84, of going 19 top-flight league fixtures from the start of a season without drawing a single game. Paul Pogba scored twice as Manchester United recorded victory in Ole Gunnar Solskjaer’s first home match since his appointment as the club’s interim manager. Nemanja Matic opened the scoring in the first half, with Pogba netting his brace after the restart. Mathias Jorgensen grabbed a late consolation goal for the Terriers, who have dropped to last place in the table. Everton ended their run of five games without a win by running riot at Burnley. Lucas Digne struck twice – including another free-kick – with Yerry Mina, Gylfi Sigurdsson and Richarlison also scoring as the Toffees got back to winning ways. Ben Gibson’s first half finish was nothing more than a consolation for Burnley. Crystal Palace failed to build on last week’s defeat of Manchester City by being held at home by Cardiff. The hosts dominated possession and recorded 31 shots, but failed to find a way past Neil Etheridge in the visitors’ goal. The draw means Cardiff have created a three-point gap between themselves and the relegation zone. The post Premier League on Boxing Day: Manchester City lose again, Tottenham go second, Liverpool and Man United both win on Boxing Day appeared first on Citi Newsroom.